Barbara A. 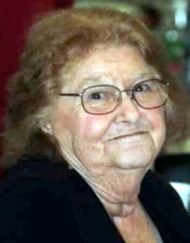 (McCarty) Rhodes, 81, of Manheim, passed away at Lancaster General Hospital on Sunday, December 2, 2018 with her loving family by her side. Born in Huntingdon, PA she was the daughter of the late Lesley and Veda (Putt) McCarty. She was the loving wife to the late Paul Rhodes with whom she shared over 60 years. Barbara enjoyed fishing and camping and was a skilled at upholstery. She enjoyed cooking and playing bingo. In her free time she loved to spend time at the Lititz Senior Center with her friends. Barbara is survived by 2 daughters: Linda Rhodes-Jones (Scott) of Manheim Township and Sharan Rhodes of Manheim; 6 grandchildren: Jennifer Teal, Chris Rhodes, Michael Garrison, Krystle Cassel, Matthew Rhodes and Ashlee Rhodes; 3 great-grandchildren: Spencer, Kadance and Violet and 4 siblings. Barbara was preceded in death by 2 sons: Ricky “Butch” Rhodes and Frank C. Rhodes. She was also preceded by 6 siblings. In lieu of flowers contributions may be made to the Lititz Senior Center, 201 Market St, Lititz, PA 17543. Memorial Services for Barbara will be held at 11AM on Friday, December 7, 2018 at the Charles F. Snyder Jr. Funeral Home & Crematory, 3110 Lititz Pike, Lititz, PA 17543. Family and friends will be received at the funeral home one hour prior to the service. Interment will follow at Manheim Fairview Cemetery. My condolences to all of the family. Mrs. Rhodes will be remembered as a neighbor and friend.